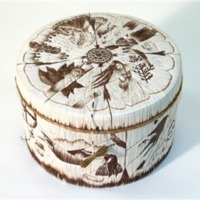 This intricately designed "quill box" is birch bark completely covered with porcupine quills and decorated with sweetgrass. It was created by Yvonne Walker-Keshick who is a member of the Little Traverse Bay Bands of Odawa, in 1994. She uses the natural colors of the porcupine quills to create the fantastic images on the box. She titled this piece, "To My Sisters" and the images illustrate the stages of a woman's life. It was made for a project in collaboration with the Nokomis Learning Center called "Sisters of the Great Lakes."